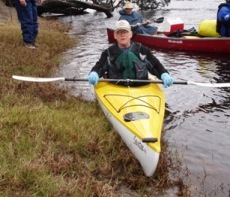 Mayo, FL--The Fellow Travelers decided to do a paddle in January but attempts to get a permit to Monkey Lake in the Okefenokee were fruitless. 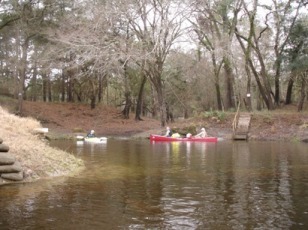 Instead the imaginative group elected to paddle on the Suwannee. 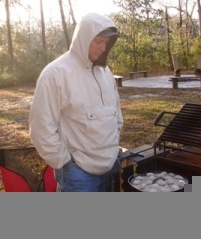 Charlie Stines arranged to get the Holton Creek Suwannee River Water M anagement District campsite for the night of January 16, 22010 but the forecast called for heavy rain all day Saturday. The group decided to canoe on Sunday instead. Donna Ellis could not make the trip but she did manage to get the reservation changed to Sunday. Ezell Landing was the launch site. Ronnie Marchant and Charlie left Moultrie a little after 5:30 AM and stopped for a McMuffin breakfast at the Golden Arches steakhouse in Madison. They arrived a little early for the scheduled * AM put-in. Brown Moseley, making his rookie trip with the Fellow Travelers and the maiden river voyage for his beautifful new Santee kayak, arrived on time. Art Shelfer and George Royal were about an hour late. Art, lacking both a GPs and any sense of direction, traveled all the way from Tallahassee to Lake City on I-10 rather than take the Madison exit. The other boats were packed and ready to float when they arrived. 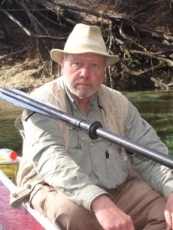 Ronnie, Charlie, and Brown paddled across the river to explore Charles Spring while awaiting the stragglers. The water level was high so it was possibl e to paddle into the spring itself, but the high water filled the spring with river water so it was brown rather than blue or green. Most of the other springs on the river would be the same. Once Art and George arrived they packed the Escape, Ronnie andCharlie used Ronnie’s newly-acquired pretty white Mohawk Nova 16, and Brown tried out his new kayak. After the boats were loaded the vehicloes were driven to Greg Baker’s spread at Riversong which is within walking distance of the take-out Royal Spring. Greg then took the drivers back to Ezell Landing in the Exhibition and then took it back to Riversong where it couldtay with Brown’s and George’s vehicle to pick up at trip’s end. Brown was not impressed by the pink trailer and opined that it was colored that way so it would be so ugly no one would steal it. He further insulted the King by poking fun at the pink Acorn socks w hich were a gift from Donna. The paddling was underway bout 9:50 AM. The rain got underway about five minutes later so the men donned raingear. The wind was furious! The water was so choppy and the waves so huge that the paddling across the river was quite scary. naturally the wind was a headwind which slowed paddling but did not cause the water to come over the bows of the boats. The rain did not last long but the winds continued well into Sunday night. The paddling was pleasant after the rain stopped and the swollen river was flowing at a pace which caused the travelers to make unusually fast travel. The five men reached Lafayette Blue Springs State Park (Yana Springs) at about 11:15. The park is still in the process of being renovated as it is converted from a county park to a state park, and one of the temporary improvements was the removal of the bathrooms. The park was empty of camp ers and personnel. The paddlers ate a lot of snacks, walked around the park and then resumed the journey. The temperature was pleasant, the wind was not, and the sky was gray. It did not take long to reach Perry Spring. The wind had eased some. The spring was cloudy andthe high water prevented the gang from eating lunch on the banks of the spring. Lunch was postponed for the landing at SR 51. It was a fast and easy paddle to the SR 51 landing. The usual shoals just upstream from the Hal Adams suspension were covered by high water so the minor thrill of minor whitewater was not to be. The landing has been completely rebuilt and now has a long concrete ramp wit a chain link fence along the top of the wall of the ramp. 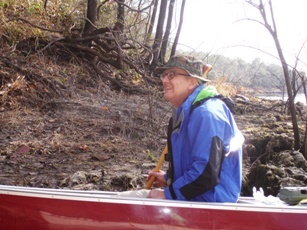 The canoes were moored at the base of the ramp and everyone carried snacks to the top of the hill. A lot of sod was at the base of the ramp and it was soggy and muddy. Nevertheless, it was a nice place to eat sardines, Vienna sausage, fruit, nuts, and candy. The five arrived at Telford Spring about 1:15. Again, the the high water casuded the spring to be tan nic rather than clear. The land around Telford is now posted but the lease-holders were there and were very pleasant. No one accepted the invitation to go for a swim. The natural bridge in the spring was covered and hardly visible due to the high water. From Telford it was a quick paddle to the Suwannee River Water Management District canoe camp at Peacock Slough. The camp host was away and the Fellow Travelers were the sole occupants of the camp. These campsites are real treat. They have screened platforrms with electric lights, a nice picnic pavilion with electricity, heated and cooled bathrooms, hot showers, and a nice fire ring. (It was far too windy to build a fire Sunday evening.) This camp featured some innovative camp chairs fashioned form 2x12 boards, so Art made a diagram and constructed some for himself after going home. George, Art, Charlie, and Ron pitched their tents inside the screened platforms. Brown’s bivy was not free-standing so he set it up on the ground. Brown also s howed off his fifty-year-old Eddie Bauer sleeping bag. The fellows sat around swapping tales and telling lies for a spell and then started cooking supper. Ronnie cooked a shepherd’s pie in his Dutch over, Art cooked an almond cake in his, and Charlie made cornbread in his. It took an extremely long time to cook due to the wind. This was Ronnie’s first time to cook for the group and he did a fine job. At about dark supper was over. The dishes were washed and the King perked a pot of coffee to insure that everyone would have to visit the bathrooms during the night. No one stayed up past 8 PM. No one arose before daylight. Charlie was first up and perked another pot of cThe wind had ceased so Brown built a campfire. Charlie prepared a decent breakfast of Canadian bacon and pancakes. The men sat around drinking coffee after breakfast. After that a fe took showers. Charlie put on his pink Boundary Waters tee shirt (a gift from grand-nephew Noah) and his pink crocs ( a gift from Greg Baker) and Brown criticized both. For a rookie Brown failed to show proper deference to the King. He had probably forgotten that it had been several years since he was Charlie’s boss. The w eather had improved from okay to great. The sky was blue. The canoes wwere loaded by about 10:45 and the paddling began. The current was still fast and canoeing was easy. There were a few minor shoals but not enough to cause anyone to get caught on the rocks or have to dismount the boats. 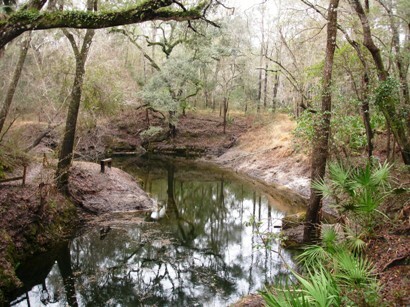 There was the stop at Running Spring, possible the prettiest spring on the Suwannee. The water was high enough to allow paddling into the spring, something that neither Art nor Charlie ever happening before. After that, the boats passed the old open railroad trestle and headed to Bathtub Spring. It was the clearest spring seen thus far but everyone stayed in the canoes and kayak. It is about a quarter mile from Bathtub Spring to Convict Spring, home of River Rendezvous. Greg had warned the waitress that she would be blessed by the presence of the Fellow Travelers. All ate lunch. The place is under new management but was just as pleasant as before. After lunch the final leg of the trip to Royal Spring began. The spring was relatively clear and there were a few people enjoying the holiday at the spring. George, Ronnie, Brown, and Charlie made the short hike ot Riversong to retrieve the vehicles, brought them back to the ramp, loaded the boats and gear, and headed home. It was a good trip and word is that Art and George were able to find their way home.